Rezoning has turned these East River waterfront neighborhoods into two of the hottest properties in town. 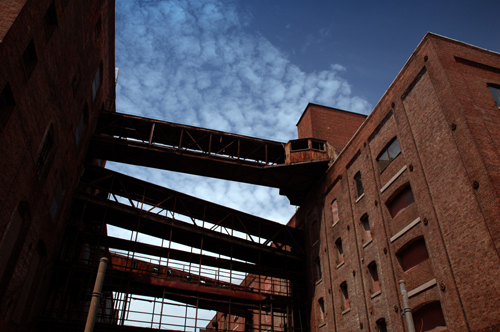 The gritty industrial strip is yielding to sleek high-rises and luxury condos. Experience some of the old industrial atmosphere and learn about changes on the horizon. Visit the ruins of the Greenpoint Terminal Market, a landmark-quality group of industrial buildings ravaged in a horrendous blaze, and the almost-landmarked Austin Nichols Warehouse designed by architect Cass Gilbert. The picture above, of course, is the Greenpoint Terminal Market before it went farewell. Check the BCUE site for more info.